We are now midway through Stoptober 2013. This month marks the second year of the hugely successful NHS campaign encouraging smokers to quit en masse for 28 days. An apt occasion, then, to revisit this engaging cartoon from the late 60s, which highlights the drawbacks of smoking. Dying for a Smoke was commissioned by the Ministry of Health in the wake of the seminal 1962 Royal College of Physicians (RCP) report, Smoking and Health [pdf]. Although previous studies had identified links between tobacco use and cancer, the RCP report attracted unprecedented levels of publicity. The government was compelled to take action, and in 1965 banned television advertisements for cigarettes. The report also called for ‘more imagination, effort and money’ to be invested in educating the public – particularly children – about the dangers of smoking. Leading British animation company Halas & Batchelor, best known for the feature length Animal Farm (1954), were drafted in to produce the film. The husband and wife duo were already firmly established in the public information sphere, having made numerous propaganda and educational short films during WWII and in the post war period. 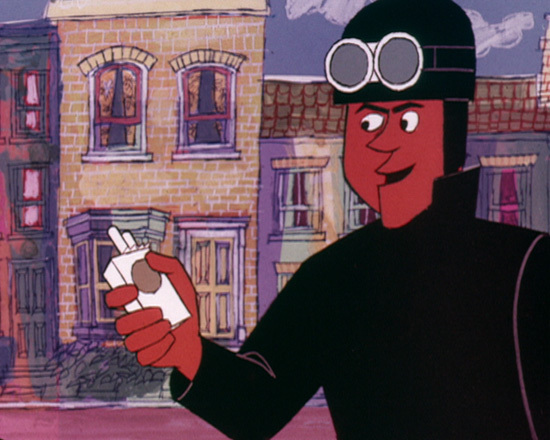 Aimed at 12-15 year olds, the cartoon features the villainous Old Nick O’Teen (voiced by Warren Mitchell, best known for playing Alf Garnet in ‘Till Death Us Do Part’), who disguises himself as an 18 year old motorcyclist to lure children into the cigarette habit. The young Sam Sucker falls into the trap, and on accepting a cigarette from Nick is transported in a haze of smoke to a dingy looking town where everyone is hooked, even the animals. Swiftly enslaved in a miserable looking chain gang, Sam’s future looks bleak. But after receiving expert advice from a doctor, and straight talk from a friendly lorry-driver, he resolves to quit for good. In the end, Sam has the last laugh, humiliating Nick O’Teen by trouncing him in a variety of sports. The Nick O’Teen character was resurrected in 1981 following reports that around a third of Britain’s adult smokers took up the habit before they were nine years old. The new campaign took the good versus evil trope a stage further with the addition of a hero, Superman. The aim was to give non-smoking a positive image as well as (literally) demonising the cigarette. As well as public health campaigns, increased taxation, and legislation to restrict the advertising, display, and sale of tobacco products to children under the age of 18 have also played their part in reducing the uptake of smoking amongst young people. According to Action on Smoking and Health (ASH) 23% of 11-15 year olds had smoked at least once in 2012; the lowest proportion since the survey began in 1982 when over half had tried smoking. The percentage of regular smokers in the 11-15 age group – classed as those smoking at least one cigarette per week – has also declined significantly from 11% in 1982 to 4% in 2012. Dying for a Smoke is included on a playlist of four films highlighting the risks of cigarette smoking on the Wellcome Library Moving Image and Sound YouTube channel. The digitised film footage is free to download from the Wellcome Library catalogue. Files are distributed under a Creative Commons Attribution-Non-Commercial 2.0 UK: England & Wales licence. 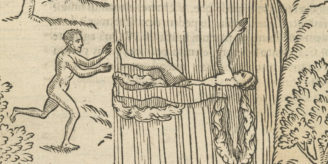 Learn more about the Moving Image and Sound Collection at the Wellcome Library.